Marvel.com: Where did the idea to recruit Mark Bagley for this cover come from? Tom Brennan: David Gabriel was the man to suggest we add variants to the Alpha and Omega issues drawn by artists who had made their mark on Carnage and the Spider-Verse during the Maximum Carnage era in the 90’s, and Mark Bagley was at the top of our list. David’s sales and marketing instincts are very creative—he’s not someone content to just add a generic variant cover; if we’re going to add a variant cover and offer it as a collector’s item, he wants it to have special meaning to the book. Since our title is a play on the epic 90’s event, he and I agreed it’d make sense to work with artists who defined that era and try to capture some of that magic and fun. Marvel.com: What was Mark's reaction? Tom Brennan: When I told Mark the name “Minimum Carnage” he let out an excited laugh and then said “Awesome, count me in.” I have had the fortune to work with Mark on a few projects here and there, so I know that if you get him enthused, all you pretty much have to do is sit back and let him draw. Marvel.com: How did you guys come up with a cover concept? Tom Brennan: I knew that if I had Mark Bagley for one image on this series, it ought to be a free-for-all battle between Scarlet Spider, Venom and Carnage. That’s what our readers want, that’s what our story is about, so as I said before, I just let Mark go to town with the two crucial elements: it’s a fight scene and they’re really tiny. He did the rest. Mark Morales is an inker who I rarely get to work with but have always delighted in speaking with, so when Mr. Bagley asked if he was available, I moved quickly to make it happen. On colors, Chris Sotomayor was a no-brainer. He’s a colorist who understands the kind of broad, primary colors I wanted to work with but also gets what modern coloring is about. He really brought it together. I also have to give major thanks to Peter Charpentier and designer Summer Lacy from our Merchandising department who worked on designing a special logo for the variant covers based on the Maximum Carnage logo. It really brings the piece together. Marvel.com: What about Minimum Carnage hearkens back to the stories that made characters like Venom, Carnage and Scarlet Spider big to begin with while also showcasing the new incarnations? 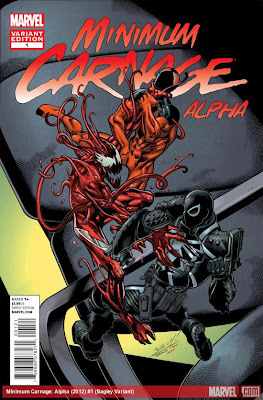 Tom Brennan: While we’ve had a lot of fun with the throwback feel of the variant covers, and the title of Minimum Carnage certainly appeals to the fond memories of 90’s Spider-Man comics, Minimum Carnage is a story very invested in pushing the stories of Flash Thompson and Kaine forward. I am immensely proud of Chris Yost and Cullen Bunn, because when Steve Wacker and I came up with the title Minimum Carnage, we really didn’t have anything else. We just reached out to the guys and told them “here’s a title, do you think we can whip up a crossover out of it?” and they just ran with it and created something new, something different and most importantly, something that advances the stories of Flash and Kaine. They are two very different men who will end this story in a very different place than they started it, and it sets off a chain reaction in both books that will define their next years’ worth of stories. The danger in the comic book editorial game can be those moments where editors come up with one idea, then take control of defining it. We stepped back and let two expert storytellers do their best, and they in turn upped their game and wrote major fun in the Mighty Marvel Manner. I will say that when you introduce a character like Carnage to two relatively new opponents like Venom and Scarlet Spider, it gives a chance to re-discover how horrifying a villain he can be, so one thing we are harkening back to is the unpredictable terror that Cletus Kasady was when he first landed on the scene in the Marvel Universe. And a big part of the fun of this is what while we as readers are familiar with Carnage—and to that end, the Microverse, extra-dimensional transportation and all the weird dangers and wild wonders of the greater Marvel U, both Flash Thompson and Kaine are still getting their feet wet in the hero game, so their genuine awe at these new worlds certainly opened my eyes to how amazing the Marvel Universe can be, and we in the Spidey office both hope and suspect our readers will re-discover that same wonder they felt when they first picked up, say, a Mark Bagley-drawn issue of AMAZING SPIDER-MAN.